One of the great things about studying in a city like Boston is having such a vast array of restaurants at your disposal. Any type of cuisine you can think of, chances are Boston has it. You can find some great Indian food, Japanese, Dim Sum, and even Burmese. However, when choosing where to eat, most people generally don't consider exploring Afghan cuisine. Enter The Helmand. Get off at The Lechmere T stop, walk ten minutes on First Street toward the Galleria Mall in Cambridge and you will find it. This quaint Afghan joint is not what you would expect. 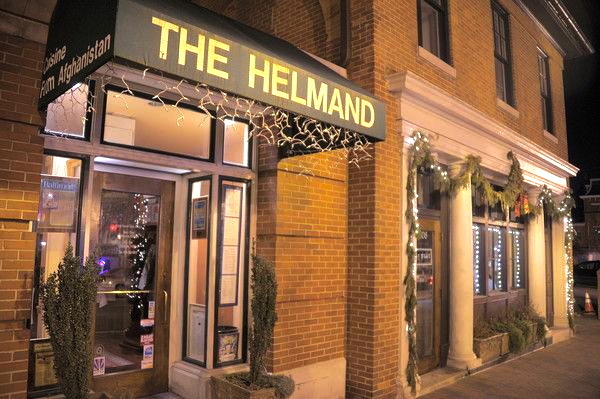 The Helmand, named after the Afghan province, is a low-profile yet typically busy restaurant. I actually went during the super bowl and by no means was the place empty. Immediately as I entered, the aromas of exotic spices such as cardamom and paprika surrounded me. The ambiance was rather romantic with glowing candles all around. Equipped with a fireplace, and decorated with plush Afghan rugs, the main dining room reminded me of a super cozy living room. On the left-hand side of the restaurant is a wood-burning oven that is used to make their famous, and might I add delicious, flatbread. Before coming to this restaurant, I had no idea what I would find. Honestly, I didn’t know much about Afghan cuisine or culture prior to this experience. Much to my surprise, Afghan food does not have much in common with typical Middle Eastern food. Common Middle Eastern dishes such as Hummus, Tabbouleh, Grape Leaves, and Falafel were nowhere to be found on the menu. The type of food offered at the restaurant was more similar to Indian and Pakistani food. One thing I noticed was that many of the dishes had lamb or ground beef. However, the restaurant also offered many vegetarian options. The names of the dishes were as equally exotic as the dishes themselves. They offered Appetizers like Kaddo (baked baby pumpkin served on yogurt garlic sauce, topped with ground beef sauce) and Aushak (Afghan ravioli filled with leeks and scallions, served on yogurt-mint topped with ground beef sauce). Before ordering, we were given a basket of the restaurant's famous flatbread with three different sauces: a yogurt sauce, a mint sauce and a chili sauce. The bread was fluffy on the inside and crispy on the outside. It was not like the more commonly known Pita or Naan, it had its own distinct qualities, and tasted amazing with the sauces. My personal favorite was the spicy chili sauce because I am a total sucker for anything spicy. For my entrée, I ordered the Showla which consisted of rice, mong beans and black-eyed peas, sauteed with onion, tomatoes and fresh garlic, then baked with dill and coriander seeds. In addition, this was served with a poblano pepper filled with spinach and cheese, and topped with tomato sauce. I have to say it was perfect. The pepper filled with spinach had just the right amount of spiciness and the warm, gooey cheese was paired really well with it. When I took the first bite, I was in heaven. Two other entrees that people at my table ordered were Kourma Challow and the Kaddo and Banjan Challow. Both of these basically consisted of baked pumpkin, lentils, ground beef and other veggies. The Kourma Challow was a juicy, savory piece of lamb with spinach rice and lentils. I tried everyone’s food. There wasn't one dish that I disliked. Finally, it was time for dessert. Although we were all stuffed, I am a huge dessert person and wasn’t going to let anyone ask for the check without trying Afghan sweets. Some dessert options that stood out one the menu were: the Pudeen which is their homemade caramel cream, Sheerberaing (rice pudding), and the “Our Cake” which is made with cardamom, pineapple and pomegranate sauce. We ended up sharing the Mango Cake special. It was a moist golden cake with crème topped with dates and mangoes. It was drizzled with raspberry sauce and served with ice cream. Surprisingly, not one of the desserts consisted of chocolate. Although this is disappointing to chocolate lovers, it doesn’t mean the desserts aren’t absolutely mouth-watering. Anyone with a sweet tooth can be satisfied! Overall, eating at The Helmand was a culinary adventure and a great educational experience. The service was great and, for the most part, the prices were reasonable even for college students. BU students, I highly recommend making the trip over to Cambridge. I promise you won’t regret it. If you go to school in Cambridge or live in the area and haven’t already been there, what are you waiting for? !